Happy Wellfie Wednesday! Welcome back! This week comes to you from Diana (@DianaKlatt), who is currently enjoying some summer south of the equator. A lot of people think of extravagant food and eating out when they think of traveling. This is a common thought because we think of taking a vacation in all aspects of our lives when we go on holiday. And then when we get home and back into our regular routines we tend to feel guilty. But we don’t have to live like this! It’s actually quite easy to stay on track when you are traveling, especially if you are traveling for longer periods of time. But how do you stop yourself from going out for every meal? Well, first of all it will be a whole lot cheaper to not eat out for each meal (which means maybe you can fit in some more travel places or stay in nicer accommodations!). The biggest thing you can do is to go grocery shopping! Airbnbs, hostels, hotels, couch surfing… these places all typically have kitchens that are available for use. Even if you are in a country where you do not speak the language, it is fairly easy to navigate grocery stores and farmers’ markets. By spending your money on local produce and groceries you are saving money for yourself, as well as making it easier to choose healthy foods. Also, by saving your "eating out" for nicer dinners, you are better able to see your actual nutritional intake and make sure that you are getting all the nutrients you need. Ultimately, this will help you eat healthier while traveling, save you some money, and stop the guilt of taking “time off” when you get back to your normal life. And plus, living like a local is fun! Thanks again for all of the #WellfieWednesday support, be sure to post your pictures this week and tag the WW crew members in your post (@TheFuelPhysio, @Eric_in_AmERICa, @AaronPerezPT, @DianaKlatt, @kuhnalyssa_spt) and keep the wave of healthy change going! Happy Wellfie Wednesday! This week is brought to you by @DianaKlatt. I am writing this week’s #WellfieWednesday from an airplane on my way to Australia! I am somewhere in hour 25-30 of this 30 hours of travel from the United States of America. I can tell you that I am not looking forward to my next long flight any time soon but it will be coming up shortly. But let’s get to it, how did I prepare for the toll that much air travel was going to take on my body? There are two things I think that you can easily prepare for and work on while on-board: blood circulation and hydration. Most of us are probably economy class fliers, so I will discuss the effects of sitting in these types of seats. Sitting in a small, narrow seat with limited legroom isn’t the most comfortable thing for even the smallest of people. 1. Get up and walk around! I’m going to be completely honest, I am that person that walks up and down the aisles doing lunges every few hours. On this last flight I also happened to have a resistance band in my pocket so I did a little bit of exercise to get my blood flowing. Below is also an image of exercises you can do while seated. 2. Wear compression stockings! This will help prevent blood pooling in your legs and help with swelling. 3. Wear comfortable and lose fitting clothing. You don’t want to wear clothes that cause any restrictions. You are already working against your posture, the lower levels of oxygen, and inactivity, you don’t need to add an extra factor. Blood circulation is not the only problem associated with flying! Think hydration! Due to the cabin pressure and recirculated air, your skin can slowly become very dry and you may feel symptoms of dehydration. What’s the best way to combat this? Drink water! You can’t bring water through airport security but you can bring an empty water bottle. Make sure you drink more water than you normally would when you’re on the ground. You can also drink whatever juices you may want but try to avoid alcohol (even if it is free on international flights… resist the urge!). Another thing, that I and many of my friends do, is to bring a sheet mask! These are full of hydrating serums and easily packable. You can pop it on before you go to sleep and take it off when you wake up with a nicely hydrated face. 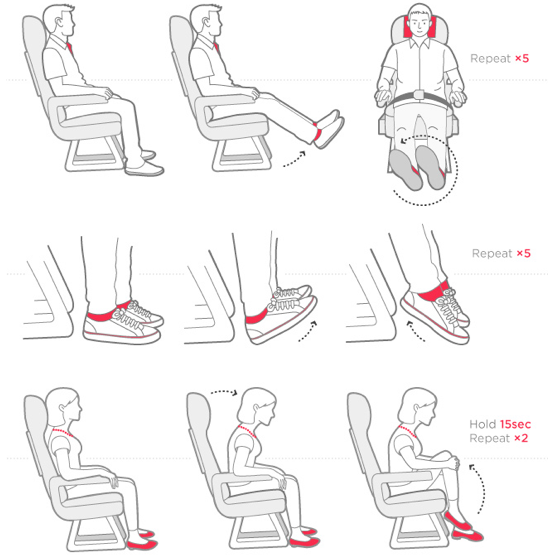 Remember these tips on your next flight! Thanks again for all of the #WellfieWednesday support, be sure to post your pictures this week and tag the WW crew members in your post (@TheFuelPhysio, @Eric_in_AmERICa, @AaronPerezPT, @DianaKlatt, @kuhnalyssa_spt) and keep the wave of healthy change going!